Yes for bottles twin alu. If you have any information to add this sheet please mail it to jw.bech@quicknet.nl References to source and names will always be added! SDBA Mk.5 – Special duty oxygen breathing apparatus. This successful equipment has been in use with many of the world’s navies and army marine corps since 1971. The SDBA Mk. 5 is a balanced apparatus i.e. the breathing bag and carbon dioxide absorbent canister mounted on the front of the diver are neatly compensated by the two slim aluminium alloy cylinders on his back. The apparatus has a constant flow of oxygen which may be bench set to a range of 0,8 – 3.0 l/min. Alternatively a selector switch may be incorporated so that the diver can choose flows to suit his work regime. A manual bypass ideally located beside the absorbent canister enables the diver to quickly adjust his buoyancy. Twin breathing tubes with non-return valves and an atmospheric valve (for venting) ensure low inhaled carbon dioxide. The whole unit may be quickly released by slipping shoulder and waist buckles. The breathing bag is construted from a tough nylon-butyl-nylon material with extremely high tear resistance. The bag incorporates a relief valve which is automatic but can be manually over-ridden. Servicing of the LSE SDBA Mk. 5 is extremely simple and training in its use has shown few problems in practise. The set is ideal for use in free swimming, canoe patrol and submarine exit. All components are non magnetic and are easily cleaned after operation. 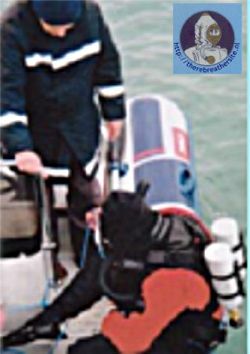 The photograph shows a diver using the ONBA special duty oxygen/nitrogen breathing apparatus which is based on the SDBA above, but which permits the diver to descend to 42 metres.